Another cart photo from me. 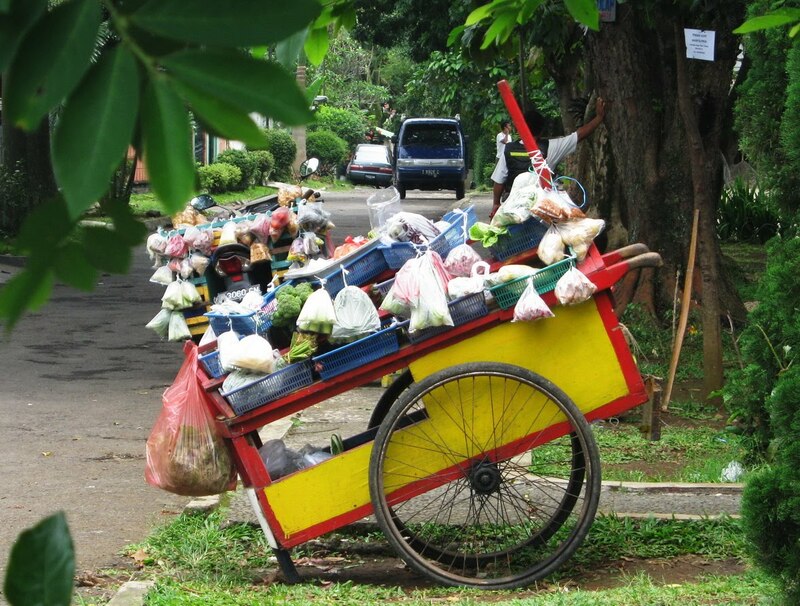 Here, most vegetable sellers use 2 wheeled carts to bring their things. Only a few sellers have used motor bikes. It’s not only vegetable; you can also find fish, chickens, fruits, and spices. For our daily meals, I often buy things to cook from them. I have subscribed to one seller for years. He passes by our home every morning. That would be a great exercise for the seller too. I really like the yellow in this. And you are lucky to have such fresh things available to you. Lina, I love your photo. Nice to see how life is lived in another country. We do not have this type of service in the US. We use to have home delivery of milk but that stopped when I was a child. We not have a company called Swans that delivers frozen meals to those that subscribe twice a month. I find that a big help and prevents my having to tote home heavy bags from the market. Thanks for visiting my MYM post on Chinese yellow glass. I missed seeing those cart already. In the Philippines we have like that too. Happy Monday! Nice post for MYM. I agree with Kim, we have similar to that in the Phils. That is really nice and you captured it great! wow! it reminds me of my home country...the Philippines. We have the same int he Philippines, they would use some kind of tricycle and would yell " veggies for sale" so people don't need to go out and go to the market. convenient huh..